We are now $35,000 closer to bringing clean water to Toloha!!!! On Saturday night, 120 guests and 22 volunteers gathered for a banquet to raise money and awareness about our clean water project. God did this! I want to scream it from the mountains. He is showing his love for the people of Toloha and the people of Kinston and Greenville, North Carolina USA. He has invited us together to take part with him in this project to reach a solution that he has planned since the beginning of time. We have much more planned to reach our goal of $170,000 to complete the project within the next 18-24 months. It will happen. If you would like updates on the water project and other aspects of Toloha Partnership, please sign up for our newsletter and email updates here. You can also donate here to be part of the solution. This is the video we shared with our guests at the banquet. It gives a look into Who Toloha is, Why we chose Toloha, and What the water situation is like there and what we propose to do to solve the problem. Tickets are available for $40 per person or $320 for a table of 8. *Tickets will be sold in advance only. The banquet will be hosted by Meteorologist David Sawyer from Channel 9 News and include a silent auction, sit-down dinner, music and a presentation about the Toloha Partnership Water Project by Daniel Makoko and Burt Rudolph (our Team Engineer from Kinston who traveled to Toloha in June). Our Toloha Partnership team has been working very hard to bring the people of Toloha, Tanzania clean water. Our engineering team and the villagers are about ready to start laying pipeline and we hope to raise enough funds at the banquet to lay at least 2 km of pipeline! This project is very close to many hearts here in Kinston and Greenville, North Carolina because Daniel Makoko came here 12 years ago from Toloha and shared with us the needs of his village. Daniel has been laying the groundwork with his people and people here in the US, and two years ago, a team was formed here in Kinston to start putting his hopes and vision to action. It has been so amazing to see what God has done to show the people of Toloha how much He loves them! Thank you for your continued support! We hope to meet you at the Banquet on November 9th! Passion, determination and generosity along with child-like faith can do BIG things! 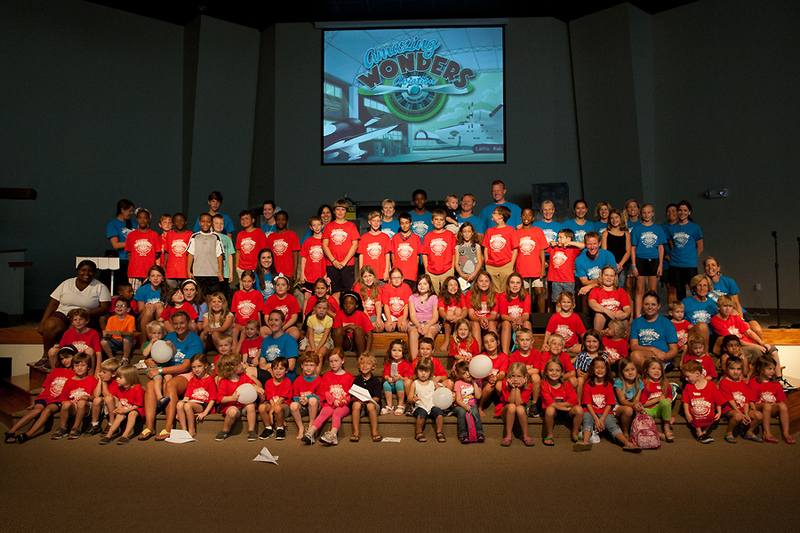 This year the volunteers from Vacation Bible School (VBS) at Grace Fellowship Church in Kinston, NC graciously adopted Toloha Partnership as their mission with 100% of the offering going to support our cause. During the week of VBS, the children were encouraged to bring in change and any money they could raise in order to help the village of Toloha gain access to clean water and the Gospel. One of the focuses of VBS was missions and I was blessed to be a part of the “Missions” corner. We began the week by talking about different missions – missions your parent’s give you (i.e. clean your room), secret missions, as well as the mission that Jesus gave us right before He ascended to heaven. This mission, or commission, as we often call it is found in Matthew 28:19-20. Basically we are to tell everyone, everywhere that Jesus loves them! On day one, we began with a little object lesson – The children were all seated on our pretend “airplane” and I asked one child to leave the room. The other children were all given a chocolate chip cookie representing God’s love. But we had one cookie left – it was meant for the child who was no longer in the room. The kids tried to get her to come back in the room without leaving the room themselves. They tried yelling, hiding and then yelling even louder, but it just wouldn’t work. They finally concluded they must leave the room and GO and find their friend and TELL her that Jesus loves her (give her the cookie). What a neat picture – in order to fulfill the mission Jesus has given us we must GO and tell others the good news! On day two, we boarded our airplane and took off for Toloha, Tanzania! We “met” (via a photograph at this point) a new friend named Daniel and discovered what the village looks like, what kind of animals are around, and 2 issues that Toloha is facing. We learned that the people are in need of clean water and that they don’t know Jesus loves them. 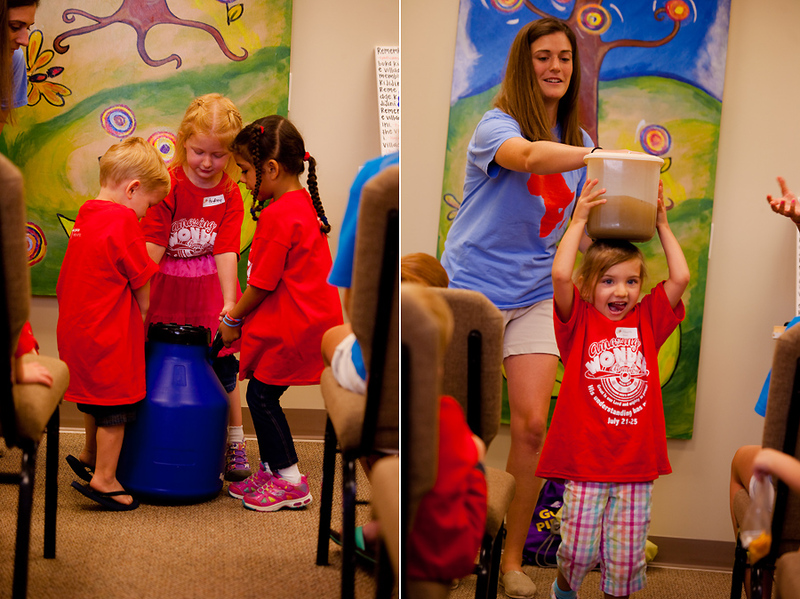 The kids were given a chance to pick up (or try to pick up) 5 gallons of water. This is the approximate amount a woman carries in the developing world and is equivalent to 40lbs! The children also learned that many women carry the water on their heads – the kids tried to do this too! On the third day, we recycled an empty water bottle into a reminder to pray for the village of Toloha. The students filled a water bottle with dirty water and decorated a label that simply said “Toloha.” The kids were challenged to place their bottle of water in their house to remind them to pray for the people in the village. For the next two days, we focused on other missionaries that were sent out by Grace Fellowship – Randy and Janet Adams in Taiwan and Chris and Carrie Himes who are leaving next month to minister with South American Mission (SAM) in Recife, Brazil. Although, we were not actively teaching about Toloha for the last few days of VBS, the children constantly had their new friend, Daniel, and his village on their minds. Not only did these kids go home and ask their parent’s for money, they got creative and did everything they could think of to raise money and awareness for Toloha. There were lemonade/cookie stands all over Kinston! Some kids made crafts and sold them while others went door-to-door selling baked goods and telling people about the village of Toloha. Still others did extra chores around the house to earn a little extra cash. There was a friendly competition between the girls and the boys to raise the most money. It was a back and forth all week, and by day four, the kids had raised an astounding $575.61! I was amazed when I saw this number! 84 kids had raised over $500 and still had another day to go! On the final day kids brought in their final offerings and joyfully placed them in the offering bucket. Little did the kids know that later that day, they would have the chance to meet Daniel in person during the closing ceremony. When he entered the sanctuary, there was a roar in the crowd amongst the kids, parents and volunteers. Excitement remained high as we all waited to hear the grand total…and find out if the girls or the boys had raised more money! The stakes were high – if the girls raised more they got to throw water balloons at the guy leaders and if the boys won, they got to throw water balloons at the girl leaders! When the total flashed on the screen, I couldn’t believe my eyes! The children had raised a $1378.33! The girls barely beat the boys, but after a total like that it was decided that everyone got to throw water balloons. The guys, including Daniel, lined up and were pelted with water balloons as kids and adults alike laughed and were filled with joy at what the Lord did through the passionate hearts of 84 children! Our team at Toloha Partnership was so amazed at and inspired by these children. They taught us that with faith, all things are possible. They also showed us that a little determination and work can reap rewards beyond our imagination. This was an amazing boost for us as we head into our fundraising in the next few months. 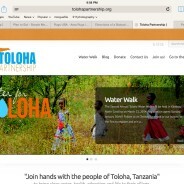 Please join us as we work to raise the money needed to bring the people of Toloha clean water! 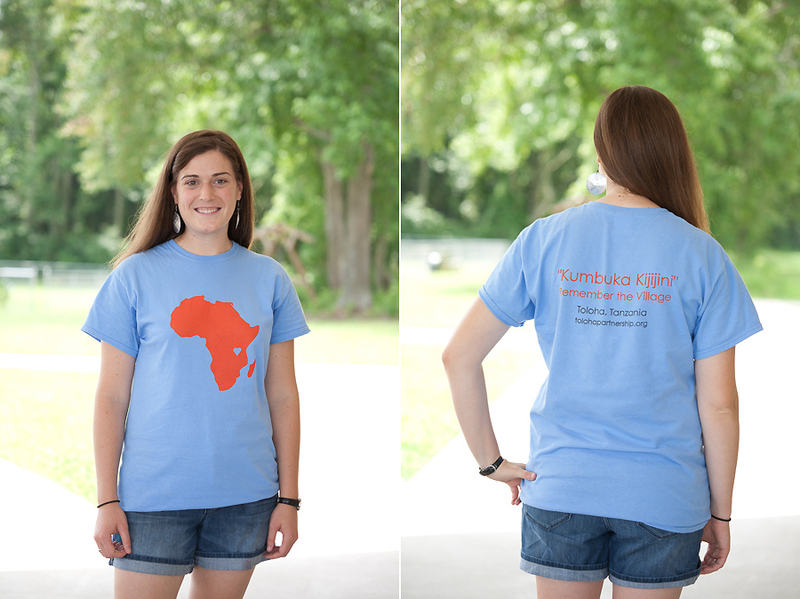 We have Toloha Partnership Tshirts available! Please contact us here if you are interested in placing an order. We have children’s sizes through XXXL available. Toloha Partnership has been given the incredible opportunity of partnering with Son Set Ministries for one of their annual camps, Erasing the Lines (ETL). ETL is a week in which middle school and high school students from local churches in Eastern NC gather to spend the week serving and showing Jesus to the community. This week (July 17-21) ETL is celebrating their 10th year with over 165 students participating. When the students arrive they are broken into small groups (mixed ages/genders/churches) of about 10 students with a college or young adult leader. Groups are assigned varying work projects each morning and afternoon. Toloha Partnership is leading one of those work projects — we are leading the “water walk” this week! You may be thinking, what is a water walk? I am glad you asked! The concept is very simple but the results are enormous. Groups are educated about the water situation in much of the developing world and then they are issued a challenge. Students are challenged to take a walk in the shoes of women and children who walk miles each day to gather life’s basic necessity – water. Students carry the water back to Rochelle Middle School (2.4 miles) where the camp is based. Along the way students have an opportunity to raise awareness by sharing with others what they are doing and why they are doing it. The students get it — they share about the need for physical water to flow as well as the living water of Jesus Christ. In Toloha, TZ, 56% of the Pare people claim Islam while 40% claim Christianity. Someone has graciously agreed to donate $1 to Toloha Partnership for each gallon of water the students tote back to Rochelle. Each group is challenged to bring back at least 25 gallons – the groups from Tuesday exceeded this toting 33.4 and 35.5 gallons! That is a lot of water…especially when it weighs ~8 pounds per gallon! It is certainly hard work but when these students hear that people are walking 6+ miles to gather dirty water, nothing will stop them from doing what they can to be a part of the solution. This is just the start — check back for updates and more pictures later this week!